Who doesn’t love tacos? I know I do. I also love recipes that incorporate dark leafy greens, such as kale, to sneak in an extra punch of nutrition. Kale is packed with calcium, vitamins A, C, E, and K, and lutein, a carotenoid important for healthy eyes. It’s also packed with fiber, which in combination with the beans, makes this recipe one healthy, hearty meal. The following recipe is adapted from the Food Matters Cookbook, changing and adding a few ingredients to match what I had on-hand in my kitchen and to add a little more flavor. If you’re not serving a crowd, wrap the leftover burritos in wax paper or foil and freeze in a tightly sealed container for an easy, future microwaveable meal. Preheat oven 300F. Stack tortillas and roll them up in a sheet of aluminum foil. Place them in the oven to warm while you cook the filling. Heat oil in a large skillet over medium heat. Add onion and garlic and cook, stirring occasionally, until soft and beginning to color, 5-10 minutes. Sprinkle with chili powder, cumin, and salt and pepper. Add the kale and cook, stirring occasionally, until leaves wilt and release their liquid, about 5 minutes. Stir in beans, and mash them with a fork or potato masher, adding a spoonful of the reserved liquid if the mixture seems dry. Place 1/4 of mixture (or 1/8 if using the small tortillas) onto a tortilla. Top with pico de gallo and avocado. Roll, and serve. Just the way I like my burritos- Packed to the brim with green goodness! Looks like a wonderfully tasty, easy meal. I definitely love tacos and this looks amazing! I love kale but have never used it in burritos. Great recipe! 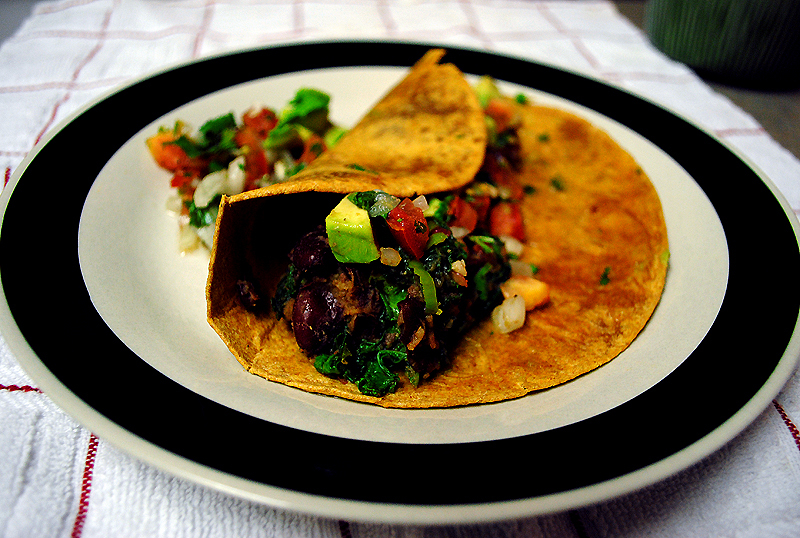 Would never have thought to add kale to a taco – too bad I just finished my kale last week! It looks so good. Perfect for fall and with lots of good, nutritious ingredients. can you believe i haven’t found kale in Australia??? you’d think it would be universal. did you have problems finding it in the UK?